This Microwave Mug Brownie is the easiest, fastest dessert on the planet — you can have it ready in minutes! Plus, it’s insanely delicious, talk about perfectly rich and chocolatey! The perfect thing to make when the chocolate craving hits but you don’t want to spend lots of time in the kitchen. 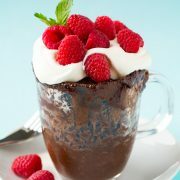 Microwave Mug Brownie — The World’s Easiest Dessert! Sometimes I feel like my blog posts really don’t need any words. Can’t a picture just say enough? But really, how can I tell you more than what a photo can show you? I’ve never really been one that has a whole lot to say. I’m more of a creative thinker who likes to sit back and read a food magazine or something. BUT when it comes to talking about food, I really do have plenty to say. So, even though sometimes photos don’t need words I still like to add them because I can’t stop thinking and talking about food. I also can’t stop thinking about chocolate. Ever. No matter how much chocolate I have, I could never be completely satisfied with that amount. Why? It’s in my nature, I’m a female and I just always want what I don’t have. Okay, I’m mostly kidding, but really I could never have too much chocolate. I crave it everyday. It’s like my daily vitamin, antioxidants right? I don’t really eat it every day, but most days. Days like today it will be 6:30 pm, just a few minutes after dinner and those dessert cravings kick in, but I’m totally feeling like I just really can’t wait an hour for brownies. What’s a woman to do? Three words. Microwave. Mug. Brownie. Yes that’s right. 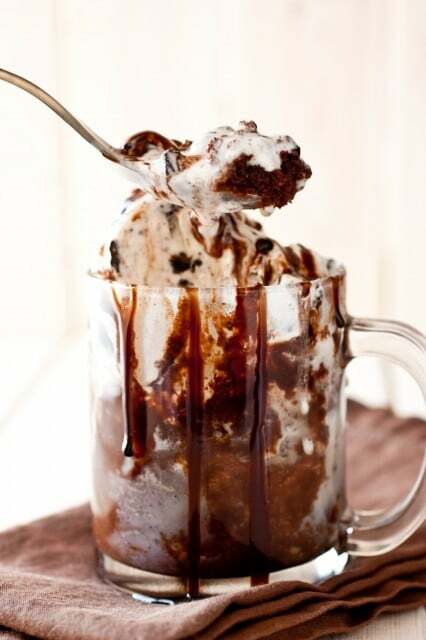 A brownie made in the microwave, in a mug, ready to indulge in, in just 5 minutes. It is a dangerous thing I tell you! This is what dreams are made of. 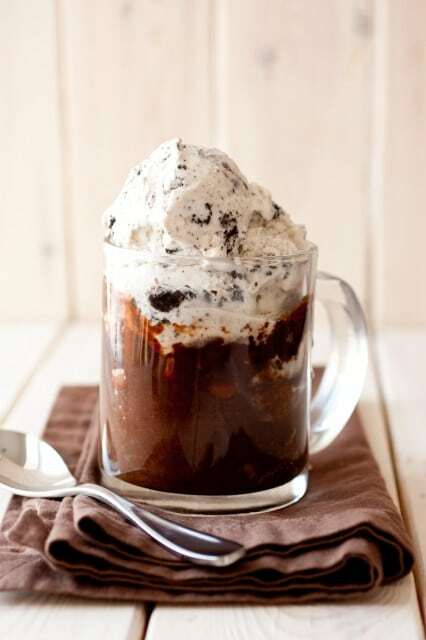 In my opinion this chocolate mug brownie MUST be served warm, and preferably covered with ice cream — which will melt all along the top surface of the mug brownie and flow through the gaps down the sides of this decadent delicious dessert. It tastes just like a skillet brownie warm out of the oven. Yes, it’s love. True love. Try your best not to make one every day. Add butter and brown sugar to a 12-oz (or larger) mug. Heat in microwave on HIGH power 45 seconds, remove and stir. Mix in egg and vanilla extract then stir in cocoa powder. Add flour, baking powder and salt and stir until well combine. Mix in chocolate chips. Set microwave on 50% power and cook mixture 1 minute 50 seconds to 2 minutes 30 seconds. 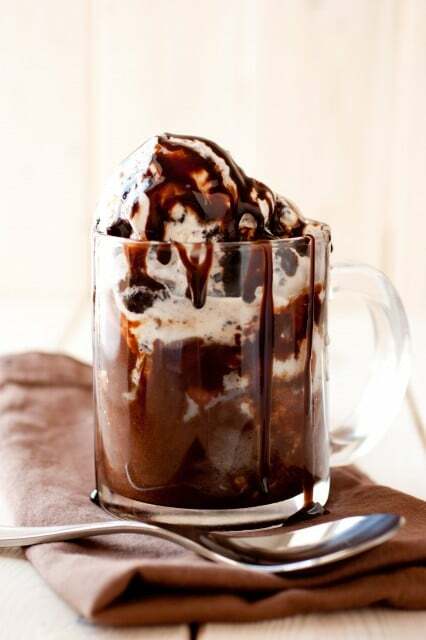 Serve warm topped with ice cream and chocolate sauce or caramel sauce, if desired. How Will I Know When the Mug Brownie is Cooked? The microwave mug brownie should be firm along the edges but still a little jiggly in the center. It will continue to set once you’ve taken it out of the microwave. Without having tested it, I can’t say for sure whether white sugar would work here. The brown sugar makes the microwave brownie in a mug super fudgy, so if you have some on hand you should definitely use it! This chocolate mug brownie tastes best warm. 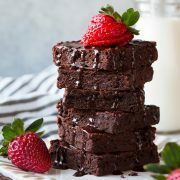 I like to top mine with a scoop of ice cream (cookies and cream and vanilla are both really yummy on top of this brownie), as well as a drizzle of chocolate or caramel syrup. Make sure you’re using a fairly large mug for this microwave brownie recipe. The brownie rises as it cooks, and you don’t want it spilling over. Be careful not to overcook the brownie. If it’s overcooked, it’ll be incredibly dry and chewy. If the brownie needs to be cooked a little longer, cook it in short bursts to be safe. This Microwave Mug Brownie is the easiest, fastest dessert on the planet — you can have it ready in minutes! Plus, it's insanely delicious, talk about perfectly rich and chocolatey! Add butter and brown sugar to a 12 oz (or larger) mug. Heat in microwave on HIGH power 45 seconds, then remove from microwave and stir mixture with a fork. Mix in egg and vanilla extract. Stir in cocoa powder. Add flour, baking powder and salt and stir until well combine. Mix in chocolate chips. Set microwave on 50% power and cook mixture 1 minute 50 seconds - 2 minutes 30 seconds (time will vary based on varying microwaves wattage, don't overcook or it may result in a tough brownie). 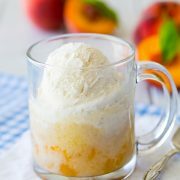 Serve warm topped with ice cream and chocolate sauce or caramel sauce and sea salt, if desired. Make sure you're using a fairly large mug for this microwave brownie recipe. The brownie rises as it cooks, and you don't want it spilling over.